Last week I shared a set of photographs of found and inherited objects including a bottle of glowing ocherous cumquat jam generously offered to me by departing friends. Homemade by one of said friend’s mothers in Melbourne, the preserve gives me a lovely excuse to get nostalgic of a morning a few times a week. On a mission to uncover the recipe, I discovered that the cumquat jam in my fridge was in fact chinotto marmalade. Lucky for me, with chinotti nigh impossible to find in China, cumquats are offered in abundance. Native to this land and with the name in Chinese name jinju literally meaning ‘money orange’, potted versions of these little fruit trees are a popular Chinese New Year gift as a symbol of prosperity. I consulted my beloved kitchen bible The Cook’s Companion by Stephanie Alexander to find a cumquat recipe to preserve these fragrant fruit. 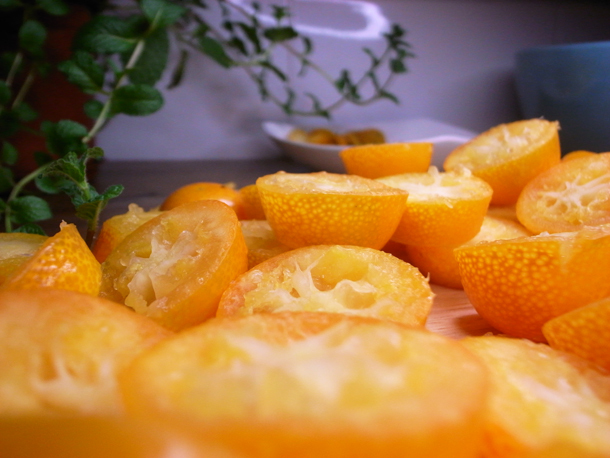 Her dedicated section on cumquats proffered the perfect recipe to trial. Just two ingredients. It couldn’t be much simpler. Remove stems and cut cumquats into quarters, removing and preserving pips. Tie the pips in muslin cloth (or a new tea towel). Put the cut fruit, along with the little bag of pips into a bowl and barely cover with water. Careful not to add too much water, otherwise it will take a considerably long time to get the marmalade to setting point the next day. Leave overnight. The next day, measure out the fruit and water by cup, counting how many cups you have (I counted 7 in my batch). 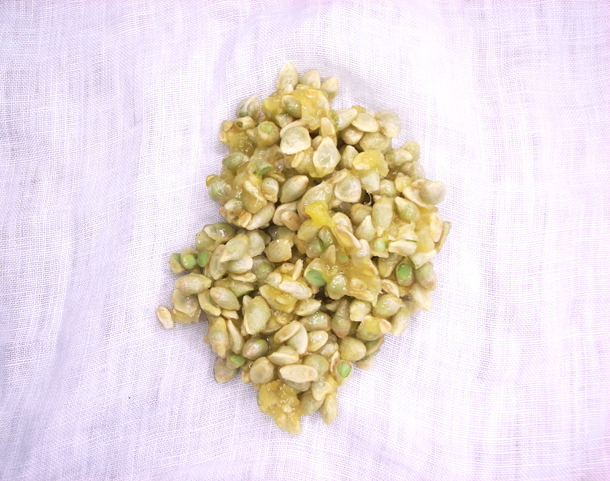 Next, put them in a pot, with the bag of pips, and cook on medium heat on the stovetop until the fruit is tender. Once tender, add the number of cups of fruit and water (previously measured) in sugar. 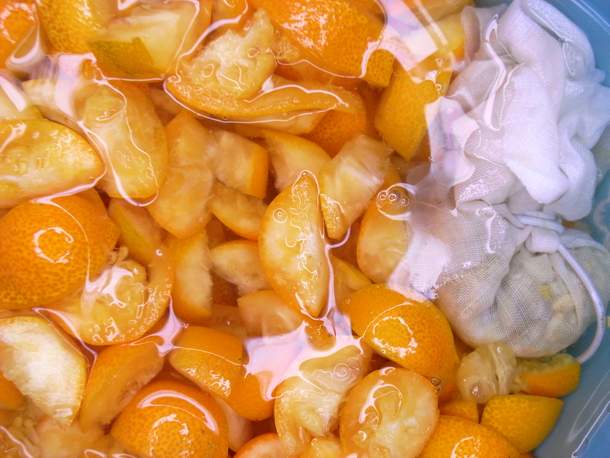 Bring to a boil until the marmalade reaches setting point. To check if set, put a spoonful of the mixture onto a cold plate, let cool for a couple of minutes and then run a finger through the middle of the marmalade. If the blob remains separate, then it’s ready. Remove the pips and bottle in sterilised bottles*. Ready to eat immediately. Makes approximately 1.5 litres. Perfect on wholemeal toast with a touch of butter. Hopefully it will bring good fortune. *How to sterilise bottles? Wash the bottles and their lids thoroughly in hot soapy water, then rinse in very hot water. Place on a tray and put in the oven at about 150 degrees for 10 minutes until well and truly dry. If your kitchen is sans oven, bottles can be heated and dried in the microwave (I have not used this method). Fill and close the bottles while hot, with hot marmalade/jam/preserve. Careful of your fingers! This entry was posted in Shanghai, Taste and tagged lauren, recipes, taste. Fantastic! I’m going to have to try this recipe soon. Any tips on how to store it? How long will it be fresh? Natasia, I added a post script above with details on bottling and sterilising. A well bottled, well sterilised jar of marmalade will last for 18 to 24 months in a cool dark pantry, if not eaten first! If by chance ample bottles are not lurking in your kitchen cupboards, I venture to think you could freeze small batches in plastic containers. Once defrosted, one batch would probably last (and this is a guess) 1-2 weeks in the fridge. FYI my batch came out a little runny, so I’m now contemplating diverse ways to serve it other than on toast. For example, on top of ice-cream or yogurt, or with my orange cake http://www.tastebites.net/orange-cake/ ! Lovely post! 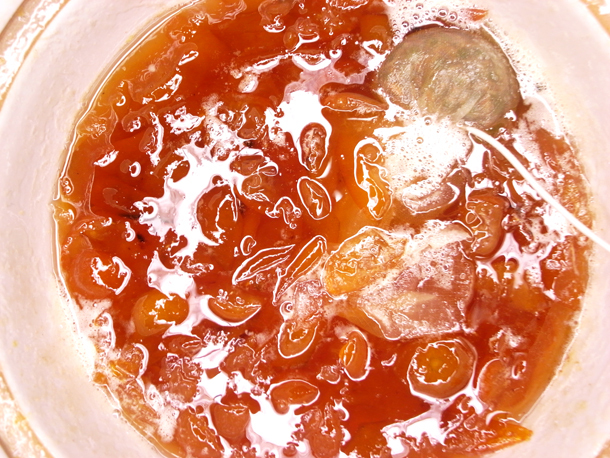 Have just spent the last two weeks cutting up cumquats to make my annual batch of marmalade – I always use the exact same Stephanie’s recipe – it’s a gem! I had never made jam or marmalade until coming to Shanghai, but as they say, necessity is the mother of invention.